The Brewing Forum • View topic - Trombone style counterflow chiller ideas? Trombone style counterflow chiller ideas? I currently have a mean immersion chiller, but I've been thinking about a counterflow chiller for initially recurculation to bring the whole of the wort down, then going direct to the fermenter for the last few degrees..
MY big concern is whether what i propose will have enough cooling power. 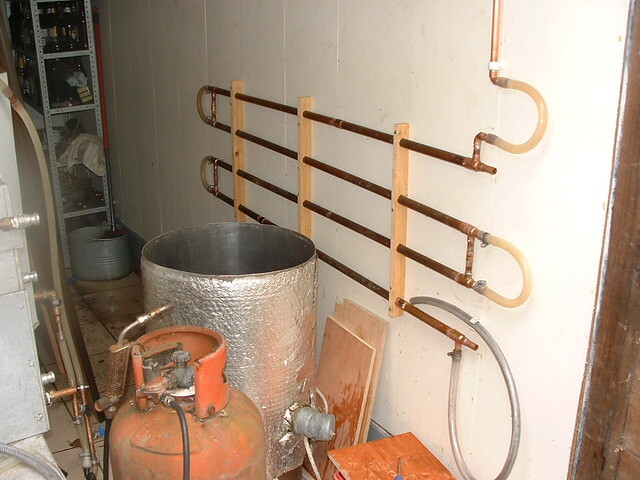 I reckon 2x 3m length of 15mm copper with a 22mm water jacket would cost around 65 quid in copper as i already have some brass hose connectors, but that isnt that cheap, so has anyone built one and would it be worth the money? How effective is 6m of cooling in 15mm copper? Would half the length be ok? If you're not au fait with the style of chiller, if you google counterflow chiller, its the video which looks like a trombone. Re: Trombone style counterflow chiller ideas? It worked ok, but the key is which pipe sizes to go for. Nice. I think i may go with the counterflow pipe in hose method actually... Defintiely cheaper, as well. One question - does the 8mm copper clog with hop debris? I heard that less than 12mmm copper can, and i make very hoppy ales, so was hoping for an accomodating system, which won't throw wobblers on brew day! ockelford wrote: One question - does the 8mm copper clog with hop debris? I heard that less than 12mmm copper can, and i make very hoppy ales, so was hoping for an accomodating system, which won't throw wobblers on brew day! Can't really say, but mine didn't, used a decent pump, Totton GP14 ?? flushed tubes though with oxy after use, normal brew technique, course filter in kettle then through hop bed..................nothing fancy......................................that's how I like to brew. Certainly got fed up with an immersion cooler when I went over 25 litres. IMO immersions are great up to 25 litres ish, but below this quantity its simply not worth the hassle of cleaning anything that would "save?" time. The best thing about my trombone, apart from pipes not dangling everywhere, was the neatness and ability to switch the water flow entering from vertical pipe, isolator valve out off shot, from cool to flush. I think mine has about 5M 15mm copper core. The jacket is 28mm not 22 to have a bit more space to work in (I've no idea if it makes it better or worse for cooling). It's all copper, but using silicone tubing like Springer's certainly looks less work. I also concertina'd mine up to fit into available space - only for folk who like plumbing! Trombones, Concertinas, ... what are we making? But I've modified the cooling, not because I found 5M insufficient, but because in Summer the ground water gets up to 18C and cooling to 20C takes ages (2-3 hours). Cooling to 40-25C happens when pumping wort through at full bore (I do recirculate the boiler through the chiller to begin with to get it down to 80C - a good temperature to add steep hops). The 40-25C output then goes through a shelf cooler (product coils) to get it down to 15-20C. Takes about 30 minutes (45L batch). I just pump clean water through to clean. I start recirculating boiling wort through it 3 minutes before switch off to sanitise it. Keep it full of clean water if not using for a few weeks to discourage verdigris. The "cooler" is also my HERMS coil for mashing (HLT water is pumped around the jacket). I used 15mm for the core because I didn't like the idea of pumping debris laden wort through 8 or 10mm pipe. But I use a big March-May pump, use the little 12V jobs and its not the pipework bunging up you have to worry about. I have a magenetic pump with stainless head, so I'm pretty confident I've got the power to push gunk through 15mm pipe. I'm mostly interested in getting efficiency and speed in cooling. If I go for 6m of cooling line, I'm back to weighing up the cost (probably around 65 quid) so its whether I stick to recirculating with the immersion chiller in the pot, or consider even buying a premade one counterflow coil with hos pipe type affair. They are 10mm though, so maybe not, I always use pellets so may clog. For now, I'm leaning thinking there may be other areas to spend money, but down the line, I reckon this will be great. I gues I'd be waiting for someone to jump up and tell me they can't do without one, but I think I may well be able to! You have a nice looking version there PB. Don't forget my scrap box or merchant route, bit more work, couplers are cheap enough, certain gets to price down dramatically.